Some times it just seems to work. The actors on stage swing together. In the interval there is talk of an ensemble style. Professionals in the audience struggle to come to grips with the secret ingredient that really anyone can see, that ancient formula that always appears new and original. It is the Holy Grail that directors so often seek in vain. It is the sunshine that eclipses the talent of the greatest stars. Why, in this most collective of art forms are we so afraid to admit that there is such a thing as group talent? Group talent is not the sum of the individual talents. In theatre it is as accessible to amateurs as it is to professionals, and ultimately, group talent has a far greater impact on the success of a production than does individual talent. A spirited, unpretentious amateur production nearly always touches more deeply than the cold skill of the professional. Of course there is no reason why there can't be the best of both worlds, and indeed, in the best of professional theatre, skill and group talent happily co-exist. Unfortunately, professionals do tend to disregard it, much to the detriment of their work, perhaps exactly because it is so accessible to the amateur. The alchemy of group talent is not something that one can simply engineer into existence. In its elusiveness it can easily remind one of individual talent. But if one understands it better one can increase the chances of it appearing. Let me say right away that group talent has nothing to do with organizational skills, and nothing directly to do with comfort or safety, any more than individual talent has anything to do with being a law-abiding citizen. In its mode of synchronizing a group it is rather more related to a curious aspect of group psychology that is exploited in a board game known as Ouija, from the French and German words for "yes." The group places its finger tips on an upturned glass and the glass floats mysteriously around among the letters of the alphabet, supposedly spelling out messages from the spirit world, often with quite entertaining results. Much more interesting than any nonsense about spirits is this way in which a group can make these kinds of subconscious agreements. Without overt leadership, without overt agreements or discussion, the group acts with a single mind. When one finds this happening in rehearsal, things get done. Goals are magically achieved. Chaos, in spite of itself, resolves into the recognizable shape of a successful production. When one finds this happening in public performance, the group displays what we call "presence." Energy pours off the stage. 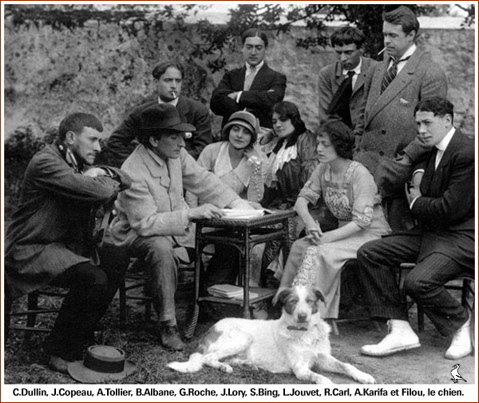 For group talent to express itself in the theatre, as for the Ouija board to work, there are three necessary conditions: a shared sense of purpose, a shared vocabulary, and an intimacy in the professional relationships. All these conditions are more likely to be met if the actors feel themselves trusted and empowered, especially if they have participated in choosing each other. Group theatres often subvert their greatest advantage by employing a constant stream of outside directors who are expected to impose their own ready-made theatrical paradigms. Designer theatre, like designer jeans. Stonewashed. Ever since Beethoven declared the artist the equal of princes, individualism in the arts has been taken for granted. Theatre has suffered as a consequence, especially with the historically recent invention of the theatre director. Edward Gordon Craig may have meant well, but the institution of the director is the perfect set-up for the intellectual to abuse the artist. The director should be a gentle midwife, for as soon as he tries to impose his genious from above he risks obliterating the group's talent. The dormant energy and qualities of the acting ensemble should always be the source of stylization in the theatre. The same principle can be applied with advantage to film. Compare David Lynch's "Elephant Man" with "Twin Peaks." Two very different styles based on two very different acting ensembles. Baz Luhrmann is also exceptional in the way he allows the attitudes of his actors, their "supertext," to generate the style of his films. One can see that the actors are not just "in on the joke," but actively defining and promoting it. Of the three conditions I have mentioned, a common sense of purpose is the easiest to achieve, and here a director can help. It may be an artistic, political, social or spiritual purpose. It may be nothing more than a shared dedication to a text. But it quickly gets people moving in the same direction. Finding a common vocabulary is more problematic. This one can take time, and we are talking about years. There are very few basic truths in theatre. Assumptions vary so much from culture to culture, and from one actor's experience to another's. Having had a similar education can help a lot. But it is so important that professional actors continue to train together and exchange their knowledge. Dancers and musicians do. Why not actors? The most fragile and dangerous of the three conditions is intimacy. I believe that good acting requires sincerity. That is not to say that there can't also be levels of irony and distance in the actor's work. In a way, sincerity is a very technical term when applied to actors. I sometimes tell student actors to exercise their "sincerity muscle!" Sincerity is something that is achieved by investing the role with a sense of "Self," by assuming an inner attitude often referred to as "defending your character." The role is then not a mask to hide behind, but a form of revelation that leaves the actor exposed. In other words, in an intimate relationship with both his partner on the stage, and the audience in their seats. Please don't confuse this with a call for Naturalism. It is definitely not. Sincerity and intimacy are also essential ingredients of even the most stylized forms of acting, from Commedia dell' Arte to Melodrama. I think most people have experienced the intimacy of two strangers meeting on a train. Two people who know that their paths will never cross again can easily find themselves sharing the most intimate details of their lives. That the priest in the confessional booth chooses to remain anonymous behind a screen is a very clever trick indeed. This "intimacy of strangers" is often referred to as "professionalism" in the theatre. It allows actors who have little knowledge of each other off stage to achieve an effective intimacy on stage. The results of this kind of intimacy can be excellent, paradoxically lasting as long as the actors remain strangers. But in the intense work environment of an acting ensemble or full time professional training program this kind of anonymity can't last forever, and intimacy becomes far more dangerous. Emotional walls are erected, doors are slammed shut, and the acting becomes stiff and boring. If at this point the actor wishes to maintain sincerity on stage with his all too familiar colleagues, he needs to make a large investment of energy learning both about himself and the other actors. Now the intimacy needs to be based on real understanding. Difficult, yes. But absolutely worth it to maintain the possibilities of group talent. That this special thing we call talent can also be a property of a group is something our modern, individualistic society is slow to recognize. It was well known to the anonymous builders of ancient cathedrals, and to the traveling families of players that were their contemporaries. Group talent is as much a random gift of the Muses as individual talent. One can't count on it alone. Technical skill must be there as a safety net. But be alert. If group talent is there, count yourselves lucky and be quick to exploit it.